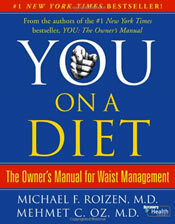 YOU: On A Diet: The Owners Manual for Waist Management is written by Dr. Mehmet Oz and Dr. Michael Roizen who are regular guests on the Oprah show. The book is written with the intention of helping dieters to understand how nutrition and metabolism affects weight loss. The basic concept is that if dieters can learn how the body works then this information can be put into effect to produce optimal results. Rozin and Oz dispel many common myths about dieting as well as providing helpful strategies to help avoid the common pitfalls of dieting. They explain that controlling the appetite is not just about willpower but is related to body chemistry. The authors break down complex physiological processes into layman’s terms so that dieters can understand why certain foods are best avoided while others have beneficial effects for weight loss and health. The diet plan focuses on nutritious meals and snacks that are to be taken at frequent intervals so as to reduce hunger while simultaneously providing nourishment to the body. Rozin stresses the importance of avoiding under eating on a diet because this will not produce lasting effective results. Three main meals plus two or three small snacks are to be taken every day. Dessert is allowed only every other day and no foods are permitted three hours before bedtime. Instead of focusing on the scale the emphasis is on waist size to gauge progress, as this is a truer measurement of improvement in metabolic health. Whole grain carbohydrates, high fiber foods, nuts, lean meats and fish are emphasized. Apples, almonds, dried fruit, edamame, raw veggies, low fat yogurt, cottage cheese or soup made with recipes from the book. Dieters are advised to take a multivitamin once a day for insurance and also take 2 grams of fish oil daily and 1/2 teaspoon cinnamon (which helps with blood glucose regulation and appetite control). In addition dieters are instructed to add 10 tablespoons of cooked tomato sauce to their diet each week for its anti-inflammatory and antioxidant effects. The book also provides lots of recipes that especially highlight soups and salads. Sample meal plans are 1700 calories. The authors state however that the point of the diet is not to track calories but to listen to the signals from the body and eat until satisfied but not stuffed. Salad with chopped mixed greens and your choice of extra chopped raw veggies, 6 chopped walnuts, 4 oz of salmon, turkey or chicken breast with olive oil balsamic dressing. Every day the minimum amount of exercise recommended is to walk for 30 minutes and stretch or do yoga for 5 minutes. The book provides illustrations of stretching and yoga postures. Three times a week it is advised to do the 20-minute ‘YOU’ workout that is provided in the book which includes exercises such as push-ups and Pilates style core strengthening. Dieters are encouraged to increase their activity as they become adjusted to this program by adding extra cardio exercise such as cycling or swimming as well as incorporating weight training and other resistance exercise into the daily schedule. YOU: On A Diet retails for $25. A workout DVD is also available for $20. Good for people who like to know the scientific explanations behind dieting. Provides meal plans that include breakfast, lunch, dinner and snacks. Written in an entertaining and engaging style. Addresses the psychological aspects of dieting. Highlights the importance of exercise for weight loss. May not appeal to those who prefer simple diet plans. Makes recommendations that could possibly lead to reduced food variety. Advocates the use of pharmaceutical drugs as appetite suppressants. YOU: On a Diet is enjoyable to read and put together in a style that makes the information accessible to all. The authors provide sound nutritional and lifestyle advice and a comprehensive meal plan with a good selection of healthy recipes. YOU: On a Diet is recommended to those who like to understand the science of dieting and metabolism. so what are you saying, that Oprah is on this diet now? I want to lose some weight, but it’s so hard and I don’t know what diet to follow. sounds wonderful, but what about this acai berry diet that I’am hearing about and they said you talk about it on Oprah? Your book really can be helpful, and its got some really inportant and helpful tips.